General guidelines from a variety of resources. Please keep in mind that we ride as a group because we want to enjoy the company of our friends. Making sure we are all safe and taking care of each other during the ride is each of our responsibility. Arrive prepared. Arrive on time with a full gas tank. Hold a riders’ meeting. Discuss things like the route, rest and fuel stops, and hand signals (see diagrams at right). Assign a lead and sweep (tail) rider. Both should be experienced riders who are well-versed in group riding procedures. The leader should assess everyone’s riding skills and the group’s riding style. Keep the group to a manageable size, ideally five to seven riders. If necessary, break the group into smaller sub-groups, each with a lead and sweep rider. Ride prepared. At least one rider in each group should pack a cell phone, rst-aid kit, and full tool kit, so the group is prepared for any problem that they might encounter. Avoid side-by-side formations, as they reduce the space cushion. If you suddenly needed to swerve to avoid a hazard, you would not have room to do so. You don’t want handlebars to get entangled. 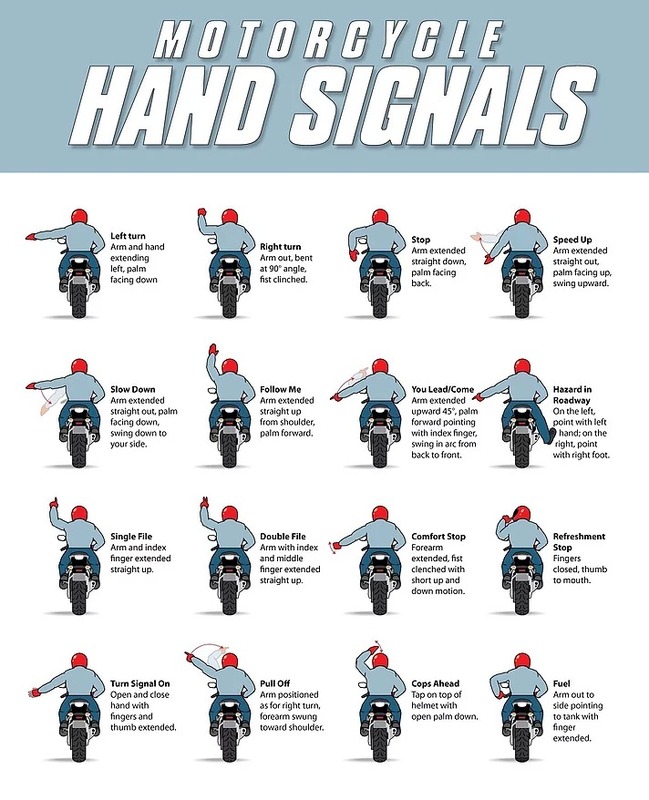 Periodically check the riders following in your rear view mirror. If you see a rider falling behind, slow down so they may catch up. If all the riders in the group use this technique, the group should be able to maintain a fairly steady speed without pressure to ride too fast to catch up. If you’re separated from the group, don’t panic. Your group should have a pre- planned procedure in place to regroup. Don’t break the law or ride beyond your skills to catch up.